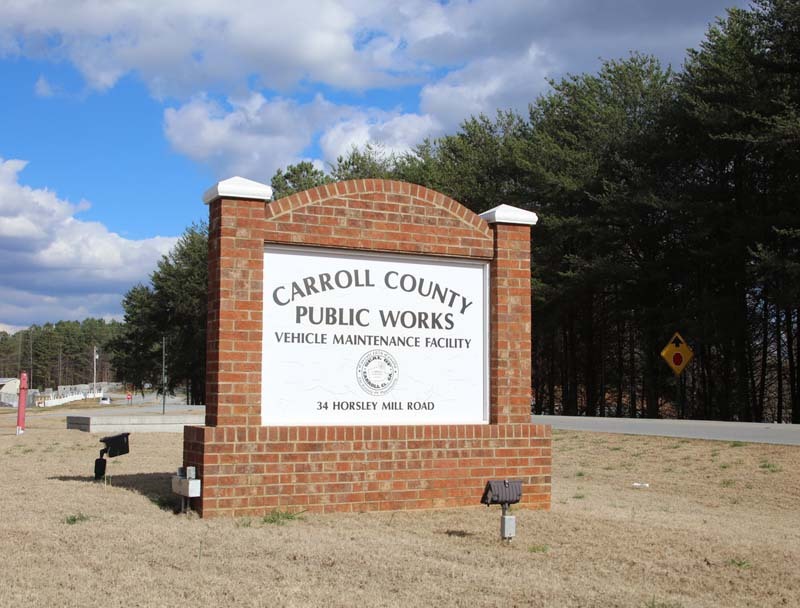 CARROLLTON, Ga., – Production is the name of the game for the right-of-way clearing crew at the Carroll County Public Works Department. They’re not interested in producing tons of chips or mulch with The Beast®, though they certainly could. 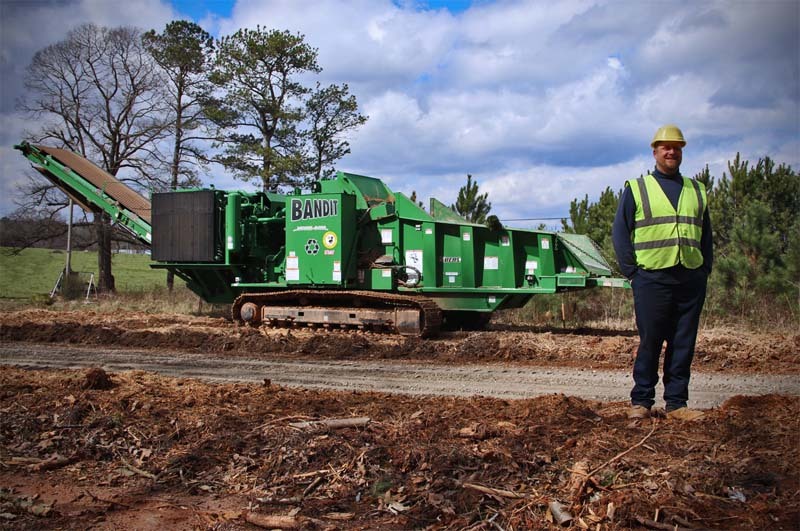 Their Model 4680XP Track ranks supreme among horizontal grinders with the capability to produce up to 800 yards of mulch per hour. They’re more concerned with staying ahead of the road crews that maintain and improve network roads in the county that shares a border with Alabama, and is home to more than 110,000 people. Kevin Wood is the clearing supervisor for Carroll County Public Works, and he’s been at the job for more than a decade. He came from a background working with large equipment, so when the county went with its first horizontal grinder from Bandit back in 2004, he was familiar with its capabilities. That machine had an 850-horsepower CAT diesel, which was top-of-the-line back then. 11 years gave Kevin and Carroll County Public Works plenty of time to spend with The Beast. So when it came time to upgrade in 2015, they knew another 4680 Track was in store. This time, however, The Beast of Carroll County would pack 1,050 horsepower. “It was definitely a noticeable difference,” Wood said from a jobsite in early March 2016. His small crew was clearing the right-of-way along a dirt road near the small town of Temple. Their position had them near GA HWY 113 so traffic was a concern. Getting the job done quickly with minimal impacts to the community was vital. 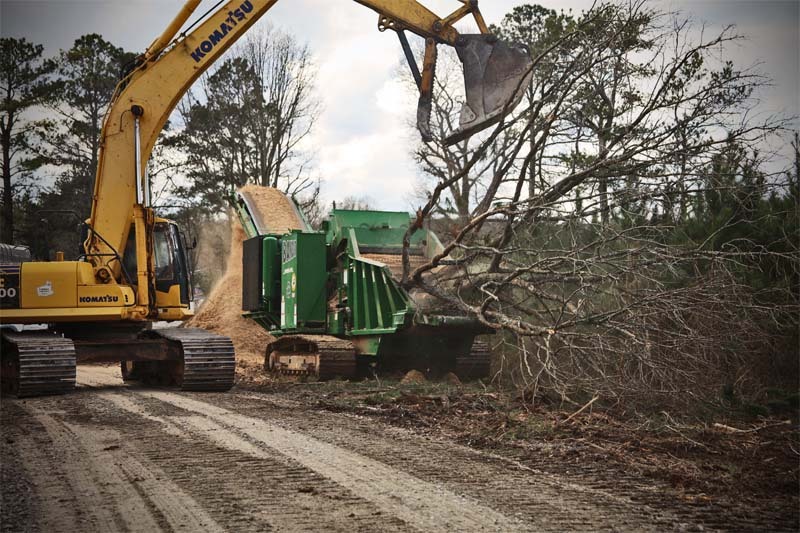 Job sites typically consist of an excavator feeding The Beast, a small crew working ahead to cut trees and limbs, and Wood himself, who operates the 4680 Track. Every new job starts with staking off the road and setting clear boundaries. Then trees are removed and piled. Getting rid of those piles is what made the county interested in a horizontal grinder in the first place. We can track to our pile, grind it up, keep on moving, and get the job done. “We were coming into issues on clearing roads for grading,” Wood said. “We couldn’t get rid of the material. You can’t bury it and there are burning bans. The most economical route was to see about a recycler." Their jobs often have them working side-by-side with residents of the county, and roads aren’t always closed when the crews are working. Staying vigilant on safety for the crew, the neighbors, and everyone’s property is always the top priority. When Wood started working with large equipment, he was already a fan of horizontal grinders. Bandit was a company he didn’t know much about, so he considered numerous machines from rival companies, including tub grinders. But safety concerns for the public and crews took tub grinders off his radar. Ordinarily, producing high-quality mulch is a primary objective for The Beast. Kevin and the Carroll County crews typically put their mulch right back down on the ground for erosion control, and the county has also given mulch away to residents. Those are just secondary benefits to the 4680XP’s true mission, which is processing material as quickly as possible. “It’s saved us a lot of time in the process of clearing, so we can save our other crews time as well,” he said. Everything on their machine is helping them save time. The extra wide infeed swallows material as fast as they can feed it. The big CAT diesel engine processes even the largest whole trees, stumps and root balls. The patented cuttermill processes more material on the first pass. But what really keeps the guys moving – literally – is the CAT steel-track undercarriage. “With a track machine we’re able to work a section and move as we go,” he said. “It helps to keep you from contaminating your product.” That results in a longer service life for the mill and teeth. It also helps prevent a huge pile of chips from forming on jobs where the chips are being used for ground cover. The customer service and support that we get from Bandit is second to none, hands down. Wood said another key advantage of The Beast is its down-turn cuttermill, not just because of the quality product it makes, but in reliability and safety as well. Because the mill turns down it’s less likely to eject material out of the infeed. The work that Wood and his crew handle is vital not just for the county, but for the residents as well. That’s where Bandit’s promise of standing behind its customers becomes a reality. I like the way the mill is setup in The Beast. I believe it’s a safer setup, not to mention the feed rate of these machines is a lot faster. It processes material much easier. Production and efficiency is important for any company, but for Wood and his crew it’s absolutely vital. The Model 4680XP Track with its big engine is certainly the right machine for the job, and Bandit’s on-the-spot customer service helps to keep The Beast working as hard as they do. So if you happen to be traveling in the vicinity of Carroll County, Georgia and hear people talking about the beast of Carroll County, don’t be frightened. The real Beast of Carroll County is big and bad, but it only eats wood and it moves so fast, you’ll probably never even see it. Contact your local dealer today and start to build your bottom line. Copyright © 2019 Bandit Industries, Inc. All Rights Reserved.